Sonos has used IFA 2018 to announce a brand-new product and reveal that it is opening up its API, in the hope that it will be the center of your smart home. 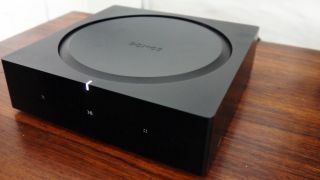 The new product is a redesigned Sonos amp, which has twice the power of the old Connect amp and can be used it in a wide variety of situations. Oh, and you can stream music off of it too. It has an HDMI port on the back as well as audio inputs, so you can power your vinyl collection with it. It will support AirPlay 2 and has a new form factor and design which allows it to fit inside a rack configuration and can be mounted, or exhibited on furniture. The Sonos Connect Amp has been around for over 10 years now, so Sonos has redesigned the device and added more power in the form of 120 watts per channel. The Connect amp wasn't optimized for TV, so Sonos has rectified this by taking the HDMI Arc module out of the Sonos Beam and put it into this new amp. It also has an IR receiver so it can control your TV, too. According to Sonos, this is the biggest advancement from the company in the connected home space so far. Sonos has also revealed that it wants to be the center of the smart home and it will do this by opening up its API to developers. It will also be releasing a new set of control APIs which will make it easier for developers to integrate into the Sonos system. Some of these APIs will be ready for the Sonos amp so you will be able to do things like notifications through the Sonos system and volume pass through. The Sonos Amp will be out in February 2019 and will be $599 (€699, other pricing TBC) - but it will only come in black, the custom installers' color of choice.